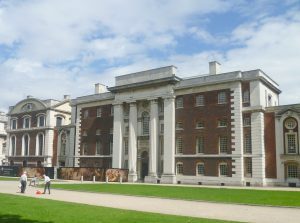 Last week, I visited the World Heritage Site of Greenwich. I particularly wanted to see the Painted Hall in the Old Royal Naval College, built by John Webb, a pupil of Christopher Wren. It was once the Royal Naval Hospital, the naval equivalent of the Chelsea Hospital for retired soldiers, the Chelsea Pensioners, and the building I had come to see had been designed as a magnificent communal dining-room for retired sailors. When I tell you that the east and west walls, together with the ceiling, was covered by a huge painting, The Triumph of Peace and Liberty over Tyranny, on every inch of which cavorted gods and goddesses from the classical world, together with portraits of notable modern scientists (from a late 17th century point of view), including John Flamsteed, the first Astronomer Royal, Tycho Brahe, Galileo, and Bernard de Gomme; and numerous allegorical figures representing rivers, the four elements, and concepts like Peace and Victory, you will understand why the first Naval Hospital pensioners asked to have their dinner elsewhere. They found it all a bit overwhelming. 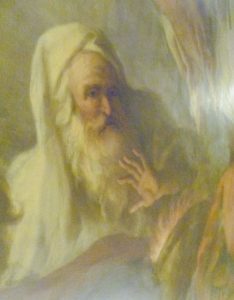 The artist who created this stupendous piece was Sir James Thornhill, (1675-1734), the top British artist of his day for the difficult art of wall and ceiling painting; he also worked at Chatsworth, Blenheim and St Paul’s cathedral. 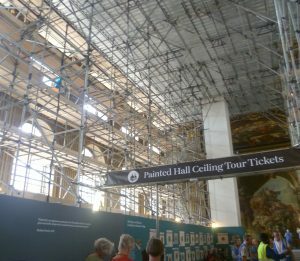 However, it is over seventy years since it was last cleaned and it needs serious conservation, and that involves an awful lot of scaffolding. The public is being allowed into what is a huge work site to see what’s going on. I couldn’t resist. Health and safety is taken seriously. We wore hard hats and luminous gilets and were briefed on what not to do, i.e. wander off. It was 70 steps up, so you had to be fit. 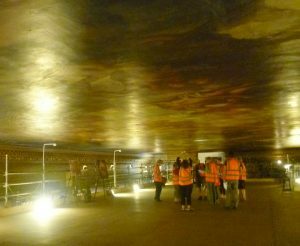 I managed to take a quick snap on the way up and it proved to be one of the best views of the various paintings, even if through a lattice of scaffolding. 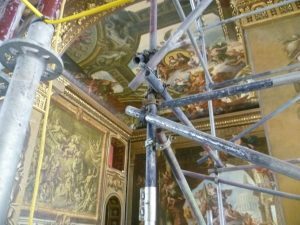 Once we’d got to the top and stood on the ‘floor’ where the conservators were working, it was easy to see what the problems were. There is no natural light up here and the painting looks as though it’s covered in a brown varnish. Our guide had a torch but it lit only a small circle of the painting at any one time. You could just about make out groups of scantily-clad classical figures lounging about on clouds, and other figures pointing at something important. Peering through the gloom, I could just see a conservator, working on the cornice. 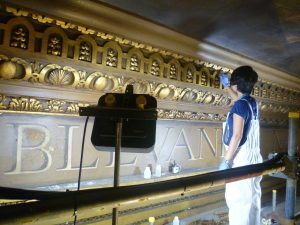 She has her own light and she is carefully wiping the cornice details with distilled water, cleaning off seventy years of dust and grime. 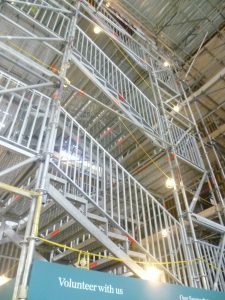 This is not about restoration, we were told, this is conservation, and it is as unintrusive as they can make it. We were told not to disturb her. 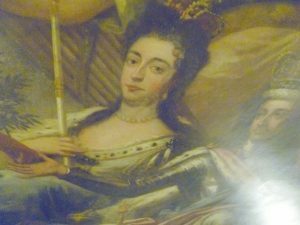 Thornhill was working on The Triumph of Peace and Liberty over Tyranny mainly between 1707-17 and he included numerous portraits of King William III and Queen Mary II. In the central oval, William and Mary, both wearing their crowns, are attended by the four cardinal virtues: Concord hovers above Mary, and Peace offers William an olive branch. Beneath his feet crouches Tyranny – a portrait of the ‘Sun King’, Louis XIV, who was a firm believer in the Divine Right of Kings. William and Mary’s mutual grandfather, King Charles I, had been beheaded back in 1649, and both monarchs were well aware of the dangers of Absolutism. There are several themes that run through The Triumph of Peace and Liberty over Tyranny, one is the virtues of a constitutional monarchy, and another is the importance of Time – particularly with regard to the sea. Sea-faring relies on an intimate knowledge of the tides, the phases of the moon, the weather, the seasons, accurate maps, and the then unsolved problem of calculating longitude. All this is reflected, symbolically, in the painting. The portrait of John Worley is interesting and unusual. He was an ordinary sailor who spent his long life at sea. In fact, he only retired at ninety-six when he became one of the Royal Naval Hospital pensioners. His longevity made him an admirable choice for a portrait of winter. 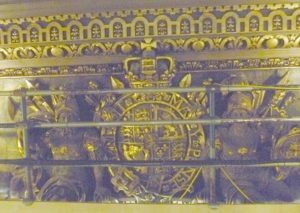 William and Mary’s royal coat of arms, now behind railings to protect it during conservation, is worth looking at. At the top right is the lion of Scotland, at the bottom left is the harp of Ireland; in the other two sections the fleur-de-lys of France are quartered with the lions of England; heraldically at least, Britain still laid claim to France. In the centre, you can just make out a small shield. This is an escutcheon of the arms of Orange-Nassau which William inherited from his father. On either side, now almost invisible, is William as Mars, the god of war, and Mary as Pallas Athena, the goddess of wisdom. It was time to go. 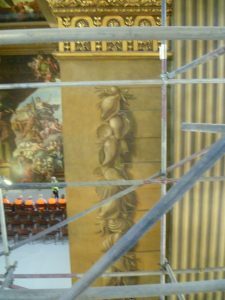 As we went, I caught a last glimpse of the west end wall painting through the scaffolding. It was an interesting experience but I’d have liked more light to see the painting properly; and I’m afraid it felt to me a bit of a wasted opportunity. Still, at least I’d been up there! I think I’ll come back to see the painting in all it’s glory once the work has been done and I’ll bring some binoculars with me. I think watching conservators or restorers at work is fascinating. There was a lot of it going on years back when I went to Florence. I was particularly struck by the difference in half the statues in one hall having been completed and half still grimed. The restored statues were not only white, they were much more detailed and intricate because you could see the fine detail which was missing in the grimy ones. One of them was a Michaelangelo and stunning. The other amazing restoration was in the San Marco murals by Fra Angelico which had just been done and the colours were unbelievable – so bright and vibrant. Lucky you, Elizabeth – it sounds wonderful. I do hope the work on the Painted Hall achieves similarly superb results. I expect it will be amazing. I remember the work on these huge statues was being done with instruments that looked like large cotton buds. Terribly intricate and slow. It takes years apparently to do it properly.